Coconut oil attacks the bacteria behind tooth decay and could be used in dental care products, according to research. Scientists found that coconut oil which had been treated with enzymes stopped the growth of Streptococcus bacteria - a major cause of tooth decay. 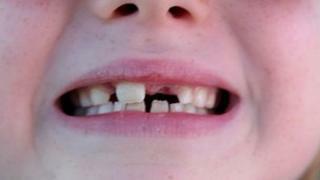 Tooth decay affects 60% to 90% of children in industralised countries. Speaking at the Society for General Microbiology's conference, the Irish researchers say that coconut oil also attacks the yeast which causes thrush. The research team from the Athlone Institute of Technology in Ireland tested the impact of coconut oil, vegetable oil and olive oil in their natural states and when treated with enzymes, in a process similar to digestion. The oils were then tested against Streptococcus bacteria which are common inhabitants of the mouth. Only the enzyme-modified coconut oil showed an ability to inhibit the growth of most strains of the bacteria. It also attacked Streptococcus mutans, an acid-producing bacterium which is a major cause of tooth decay. It is thought that the breaking down of the fatty coconut oil by the enzymes turns it into acids which are active and effective against bacteria. Previous research found that enzyme-modified milk could stop Streptococcus mutans from binding to tooth enamel. Researchers now want to look at how coconut oil interacts with Streptococcus bacteria at the molecular level and which other strains of harmful bacteria it can inhibit. Dr Damien Brady who led the research at the Athlone Institute of Technology with Patricia Hughes, a Masters student, said coconut oil could be an attractive alternative to chemical additives. "It works at relatively low concentrations. "Also, with increasing antibiotic resistance, it is important that we turn our attention to new ways to combat microbial infection." Their studies are also looking into the workings of antibacterial activity in the human gut. "Our data suggests that products of human digestion show antimicrobial activity. This could have implications for how bacteria colonise the cells lining the digestive tract and for overall gut health," said Dr Brady.